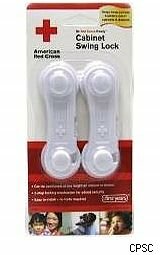 The First Years American Red Cross brand cabinet locks, intended to keep small children from getting into cabinets containing hazards, are being recalled because they have a propensity for breaking, the U.S. Consumer Product Safety Commission said. When the latches break, children can get into the cabinets that were supposed to be secured. Learning Curve Brands, which operates as The First Years, told the CPSC that it has received seven reports of the latches breaking. Complaints about product failures typically represent a small fraction of the actual number of incidents.Sets of two Cabinet Swing Locks -- which can also be used on drawers -- were sold at Toys R Us, Babies R Us and other stores and online sellers between September 2008 and September 2010 for about $4. About 41,300 were sold, the CPSC said. The packaging on the Chinese-made product carries a Red Cross logo and is labeled with item number Y7181. Date codes are molded onto the back of each of the latches. Consumers are urged to remove the latches and contact The First Years to get a $5 coupon toward another product made by Learning Curve. Call (866) 725-4407 weekdays between 9 a.m. and 6 p.m. Eastern Time or visit the company's recall site.